There are different tools available in SAP for doing the business in the better way to get the profits. “Resource Cost Assignment” means allocating costs from cost centers to processes. R/3 includes several methods to accomplish these allocations. Any combination of these allocation methods may be used. 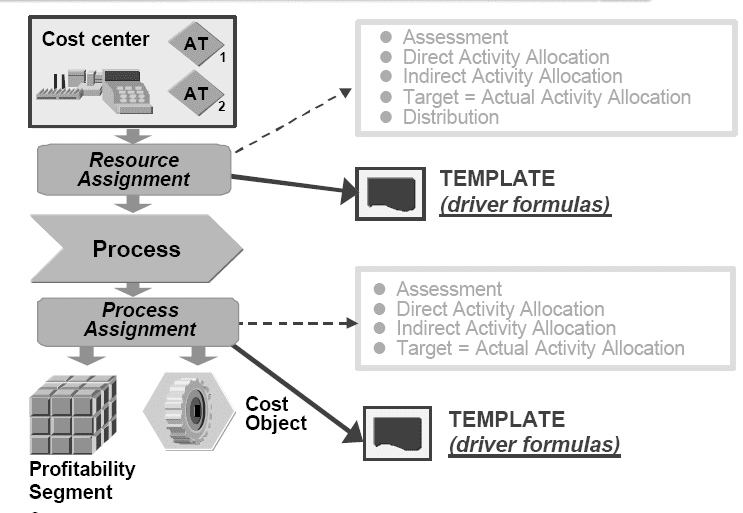 “Process Cost Assignment” means allocating costs from processes to cost objects or profitability segments.R/3 includes several methods to accomplish this allocation.Any combination of these allocation methods may be used. Allocations from and to processes may be done using distribution, assessment and activity allocation.These techniques have long been available in R/3 and are not new to ABC.In addition to these methods, the template is a new tool for allocation. The new tool provides a more general capability than the other methods since it includes the use of formulas and functions.The use of templates results in a quantity and value flow. 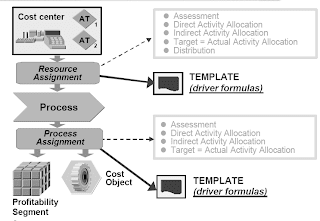 A process driver is the quantity measures of the process that is being assigned to (consumed by) cost objects and profitability segments.Process driver quantities may be found from almost anywhere within R/3 or in external systems.Often the cost object itself contains process driver relevant information. Such structures as the BOM, Material Master record, and router provides a wealth of potential process driver information.For process drivers based on transactions, information on quantities can be retrieved from the Logistics Information System (LIS).The template is the tool which can dynamically calculate the quantities consumed by cost objects and by profitability segments . Processes may also be manually allocated to cost objects and to profitability segments. A template is created within a certain environment, which is determined by the cost object that will consume the process quantities. For instance, a process that will be consumed by a PP production order will be controlled by a template created in environment 001, while a process (and it may be the same process) that will be consumed by a sales order will be controlled by a process template created in environment 008.A template consists of pre-defined columns. Each of these columns is looking for information - that is asking a question. The answer may be “hard coded” by the user, or found dynamically by the system.The real power of ABC in R/3 is realized when the system answers these questions dynamically. Each environment contains a specific set of functions for the user to select from to customize how to answer the questions shown above. You create a template by using the functions in a row across each of the columns. Each template can contain as many rows as are necessary.There are 3 different types of rows that can be created and these can be combined on one template.Each type of row serves a different purpose. A Comment row is used for documentation. A Business Process row is used for process consumption by a cost object. A Sub-template row is used to link templates for a nested template structure. A calculation row can be used when multiple Business Process rows use the results of a single calculation (on the same template only). If the template is created in the SBP (Structured Business Process) environment then an additional row type of TASK is available to allow the Object column to use a cost center/activity type. Each cost object in the system has its own environment pre-assigned to it in the delivered system.These assignments cannot be changed.Each environment contains pre-assigned sub-environments. This assignment is also fixed and cannot be changed.Each sub-environment contains a collection of specific functions which is designed to work with the data in that particular sub-environment. For instance, a function designed to read the material characteristics assigned to a material in the material master will be found in the material sub environment in the environment defined by the consuming cost object. The template, which is assigned to a specific environment when it is created, has access to all of the functions and the corresponding data that they can resolve, found in the different sub-environments. A sub-environment may be assigned to more than one environment, making the functions within the sub-environment available to more than one type of cost object. For instance, the sub-environment containing the functions involving routers is available to the sales order and the production order but is not available when using cost estimates without a quantity structure. New user defined functions may be created and assigned either to a sub-environment or directly to an environment. Assignment to a sub-environment provides for more flexibility because more than one type of cost object can use the function.In customizing, you can restrict the use of each new function to a single template cell. Inside each cell, the specific purposes of each function may be further defined for such things as parameters, whether a value is entered or defaulted, what the default value will be, etc. The purpose of these restrictions is to assure that the function hierarchy only allows the template to use a function where and how it makes sense. For instance, when a function requires a material number as a parameter, only material number functions are made available. The sub-environments are also delivered and fixed in the system. This means you cannot create new environments or sub-environments. However, you can move functions to different environments, and you can create new functions. There are two different kinds of functions, table -field and ABAP functions.A table-field function allows for a function to use fields from tables that have been allowed in the specific, delivered environments.An ABAP function is required if you need access to a field in a table which has not been included in the specific, delivered environments.If new functions are created they must be maintained within the template environment area in customizing. If new functions are created the 3 level naming convention must be followed which provides for an external name, internal name and a logical function name.Functions can be copied, changed, and/or re-named.